Yes, Minnesota is committing societal suicide as they not only elected a Muslim who married her brother to represent them in Congress, but they elected a Communist-backed, Muslim who stands accused by several women of physically and verbally abusing them. On top of that, Keith Ellison, aka Hakim Muhammad, has a plethora of traffic violations, including driving while his license was suspended, and unpaid taxes to the IRS. In short, they have elected a criminal as attorney general. So, Minnesota will have a new attorney general in Hakim Muhammad, but he is a corrupt man. Keith Ellison’s traffic law violations were a major issue for him before he ran for US Congress in 2006. His driver’s license was suspended. Public records reveal his pattern of reckless behavior continued. Minnesota media – not a word about it. In addition to unpaid taxes to the IRS, Keith Ellison’s many traffic tickets became one of the issues for him when he ran for US Congress the first time. Scott Johnson from Powerline has written about it as far back as 2006 when Ellison first ran for US Congress. Back then Ellison’s driver’s license was suspended even at one point. This whole summer Ellison has been driven around by other people to various events which have had some of us wondering if his driver’s license isn’t suspended again. Next, though it was reported back at the end of August that Ellison had made steps toward activating his license, there was no evidence he had done so. Though his law license is not active, DFL attorney general candidate Keith Ellison has completed the 45 hours of continuing legal education credits needed to get it reactivated, according to a campaign spokesman. Ellison also has filed a plan with the state Board of Continuing Legal Education that commits him to an additional 45 hours of CLE training, said Sam Fettig, Ellison’s communications coordinator. Though she wouldn’t comment specifically on Ellison, CLE Board Director Emily Eschweiler confirmed that those two steps would put an attorney on track to reviving a voluntarily inactivated law license. Ellison’s license to practice has become something of a conservative meme. It was broached during Sharon Anderson’s unsuccessful primary bid for attorney general. She filed a petition with the Lawyers Professional Responsibility Board to revoke Ellison’s eligibility because he lacked CLE credits and carried an inactive license. But Anderson said last month that effort had failed. Ellison’s general election opponent, Republican Doug Wardlow, took the issue up on Monday. A Wardlow press release claims that Ellison “surrendered” his law license and then falsely stated that members of Congress must give up law licenses upon taking the oath of office. Wardlow also maintains that Ellison has a 180-hour deficit in his CLE requirements. Based on information supplied by the CLE Board, however, that statement likely is incorrect. It is not clear if Wardlow’s 180-hour tally of unfulfilled CLE credits is accurate. The total is based on a belief that Ellison’s gave up his license in 2012, according to the press release. But Wardlow’s spokesman Billy Grant said Monday that it might have been deactivated as early as 2006. So Ellison might lack an even more credits, he said. Either way, it likely won’t matter. To fulfill all his commitments, Ellison likely would need to earn no more 90 total CLE credits. Rule 12 of the Continuing Legal Education Board’s rules does state that to be automatically transferred to active status, attorneys must make up all unfulfilled CLE hours. But automatic transfers aren’t the only path to reinstatement. Rule 12 also permits a “discretionary transfer,” which allows the CLE board director to activate a license without forcing the attorney to make up every missing credit hour. There are guidelines to follow, Eschweiler said, but it can be done. 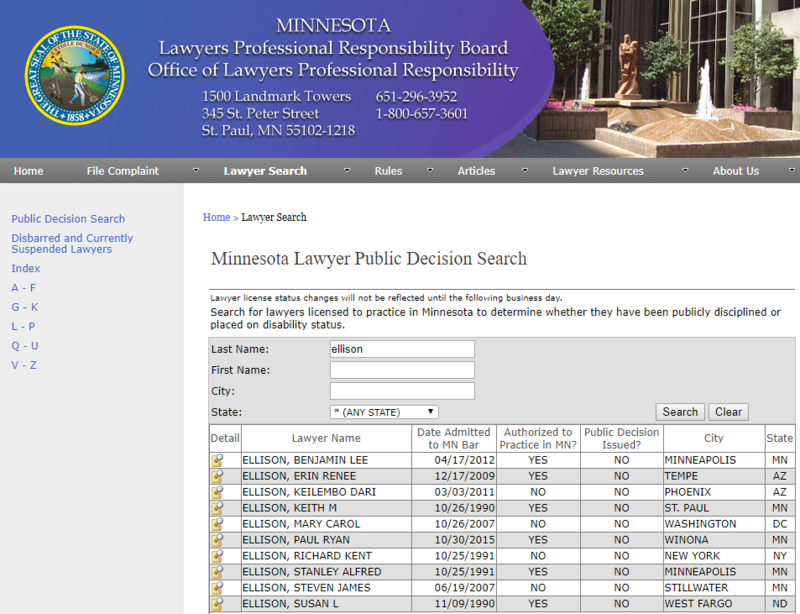 A search of Minnesota Lawyers Professional Responsibility Board did result in showing that Ellison is now active as an attorney in the state. However, the report above was published on August 30, the Lawyer registration office confirms that he became active again on August 29, 2018. Calls to the CLE office to determine whether Ellison put in the require education training time or whether someone used the "discretionary transfer" to make him active were unreturned at the time of the writing of this article. According to many who live in the state of Minnesota, Muslims were being bused from precinct to precinct to vote over and over again for Ellison. Massive voter fraud has been suspected to put Ellison, a man who is clearly anti-American, in the office of attorney general. Then there was this little nugget from a Democrat a couple of years ago when Ellison was seeking the DNC chair regarding his disregard for the law. Bob Mulholland, a DNC member from California and one of 447 who will vote in the February election, says he has not backed a candidate yet but will not support Ellison. Now, Minnesota has gone far beyond making him head of a political party. They've installed him as their attorney general. Minnesota is a very corrupt state, as far as government is concerned. Democrats have held the office of attorney general since 1971. Now, they have a Communist-backed, anti-Christ Muslim in the position. Does anyone in their right mind think that Keith Ellison will be upholding the law or will he be engaging in more violations of the law, possibly using his position to cover for allegations of woman abuse in the future? Time will tell. Next AG Jeff Sessions Resigns - Is Trey Gowdy Next AG Appointment?